I love tomatoes. Many of us do. But can we eat them in good conscience when we know that the farm workers who pick them are grossly underpaid and work under conditions that most of us do not and would not tolerate? Can we live with doing nothing when the companies (like Publix) who hire them or who benefit disproportionately from their labor refuse to acknowledge their responsibility for the plight of farm workers, and will not engage in constructive conversation about meaningful change? Learn more about the Fast for Fair Food and join Florida clergy and congregations in praying that with God’s help, Publix’s isolation and hesitation can be transformed into communication and cooperation with the Coalition of Immokalee Workers. View and share the Faith Moves Mountains video and materials and join your prayers with thousands across Florida. I’ll keep in touch next week through our Facebook page and Twitter, sharing stories of the farm workers’ struggle and the community gathering around them, fasting and speaking for justice together. Across Florida and the southeast where Publix grocery stores are prominent, people of faith are encouraged to drop off a manager’s letter when they shop, and to support or organize events such as the Interfaith Clergy Press Conference and Open Letter to Publix on March 6 in Tallahassee which includes Presbyterian clergy: the Rev. Brant Copeland, the Rev. Tom Borland, and the Rev. Mary Vance. Learn more about ways you can pray with and support the Fast for Fair Food. 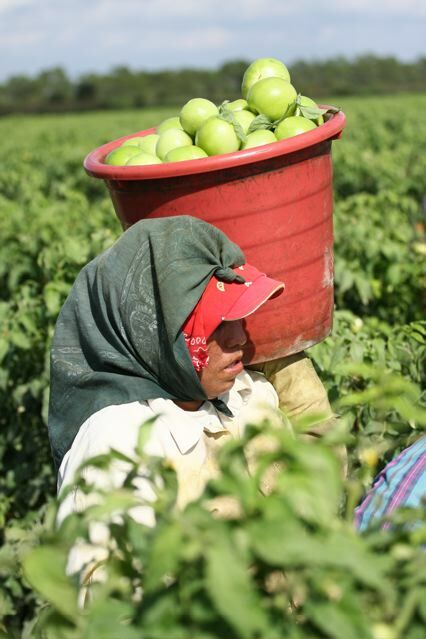 Photo of tomato picker by Scott Robertson. Invite friends to join the network.